Branson Fall is an interesting phenomenon. There have been Branson Fall auctions in advance of contested national elections when the bidders were flat and preoccupied. The upcoming midterms, however, seemed to have little or no effect on the size or enthusiasm of the Branson crowd and bidders this year. The room was full and the number of registered bidders was a record. I’m less than assiduous in writing up cars (or collecting after-sale data), having spent my Branson weekend on the block doing lot introductions (“color”) rather than collecting data and impressions of the docket vehicles. This year the gig was a little different, with an altered crew on the block including Jerry Daisy doing the color. I was promoted (if that’s the word) to the back of the convention hall doing color commentary and participant interviews on the Branson Auction’s live YouTube feed for both days. We were new at this, which is obvious in particularly the Saturday video when the block video was sometimes low resolution and the commentary got blown away by the block audio on many occasions. 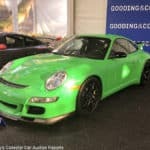 The video is available on YouTube at bransonauction.com. The gig won’t earn me “talent” designation, but there’s a lot of information on some of the cars, market developments and interviews with participants, including Tony Marriotti, the bartender who’s been dishing drinks to Branson Auction clients for almost fifteen years. We need to fill up Tony’s tip jar so he can buy a car at the auction. With 60 lots sold on hammer bids under $10,000, Tony’s tip jar doesn’t have to be very big. There are only ten vehicles described in detail. I was distracted by video stardom; and a bit of stage fright. 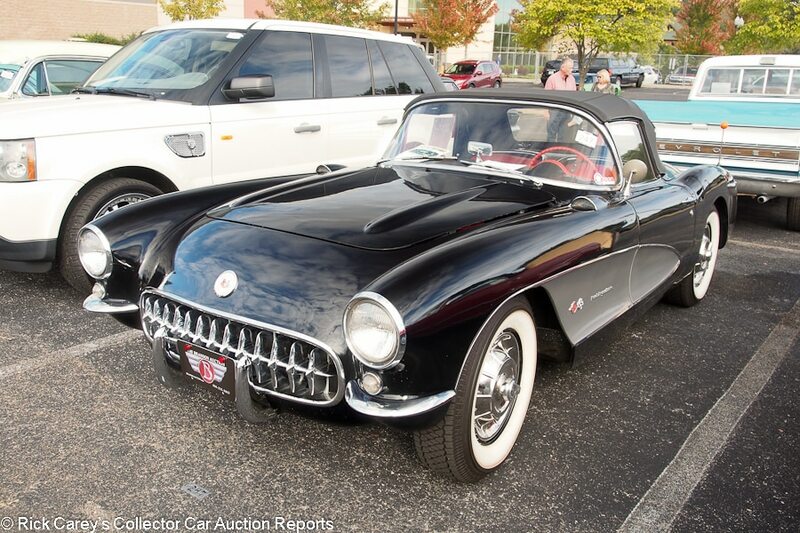 Lot # 247 1957 Chevrolet Corvette Convertible; S/N E57S103962; Onyx Black, Silver coves/Red vinyl; Black vinyl top; Older restoration, 3- condition; With Reserve; Hammered Sold at $48,000 plus commission of 10.00%; Final Price $52,800 – 283 V8, Edelbrock Performer intake and 4-barrel, 4-speed, WonderBar radio, spinner wheel covers, wide whitewall radial tires. – Blank engine number pad, Fuel Injection badged. Tired, cracking, flawed old paint, thin chrome. Tidy engine compartment showing some age but little use. Sound older interior, good dash and gauges. Newer top over an aged and torn inner liner. A mediocre Corvette that is not going to see an NCRS judge any time soon. 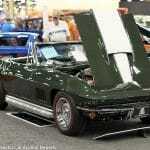 – Compromised by the engine modifications and an unnumbered pad that indicates a replacement of some sort, not to mention the condition issues and age, the seller got full money for value from this Corvette. 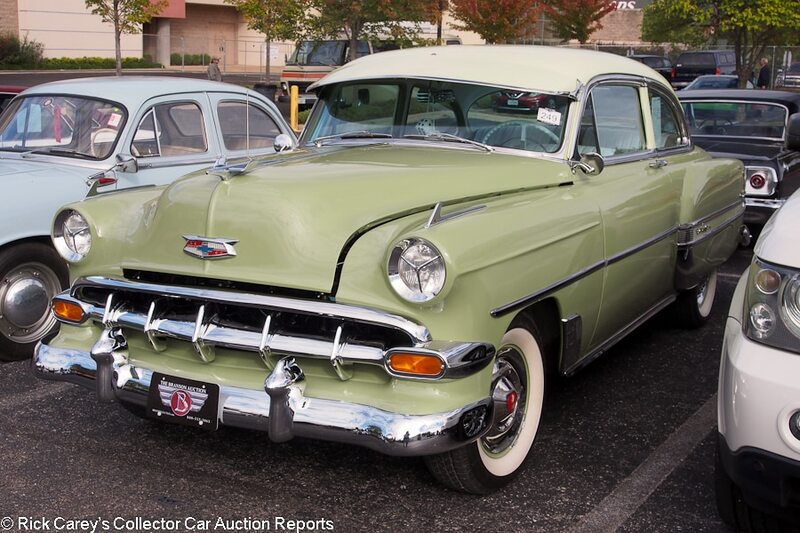 Lot # 249 1954 Chevrolet Bel Air 2-Dr. Sedan; S/N 54L004938; Greenish Yellow, Yellow roof/White, Green vinyl; Modified restoration, 3- condition; With Reserve; Hammered Sold at $15,800 plus commission of 10.00%; Final Price $17,380 – Vintage air conditioning, 3-speed, CD stereo, wheel covers, whitewalls, windshield visor, skirts, tribar headlights, alternator, Fenton headers. – Very good recent repaint, bright chrome, good interior in a modified pattern. Rusty vent window frames. Polishing swirled paint. Orderly engine compartment, but grungy chassis and underbody. A usable cosmetic restoration with good equipment for tours and weekend cruises. – A fair result for a fair Chevy. 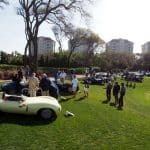 Lot # 250 1957 Panhard Dyna Z 4-Dr. Sedan; S/N 1038497; Light Blue/White, Blue vinyl; Unrestored original, 4+ condition; With Reserve; Not sold at Hammer bid of $8,000 plus commission of; Final Price $8,000 – 851cc/50hp opposed twin, column shift 4-speed, hub caps, Michelin tires, suicide front doors. – Represented as 38,764 kilometers from new. The paint looks original and has several scratches and chips all over but is still shiny and sound. The engine bay is grimy. The seats are stiff and discolored and the upholstery is loose. The plastic dash trim is cracking a bit. The frame is a bit grimy but free of rust. The bumpers are scratched up. 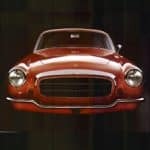 A charming little car that was a clever and remarkably sophisticated design in its day. The all curves and rounded corners aluminum bodywork is reputed to have a drag coefficient of 0.28, which is something most modern cars would love to have. The 2-cylinder air-cooled engine has roller bearings for the crank and rods and uses torsion bar springs for the pushrod-operated overhead valves. The whole thing weighs under 2,000 pounds. You don’t see them often on this side of the Atlantic, and it got a lot of people’s attention during the sale. Even so, it’s totally original and there’s no telling what kind of work and hard to find parts it needs. 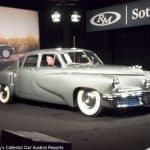 – Having sold at Barrett-Jackson’s Las Vegas auction a year ago for $13,970 and added only 19km to its odometer since then it’s not surprising the consignor held off on taking the money. 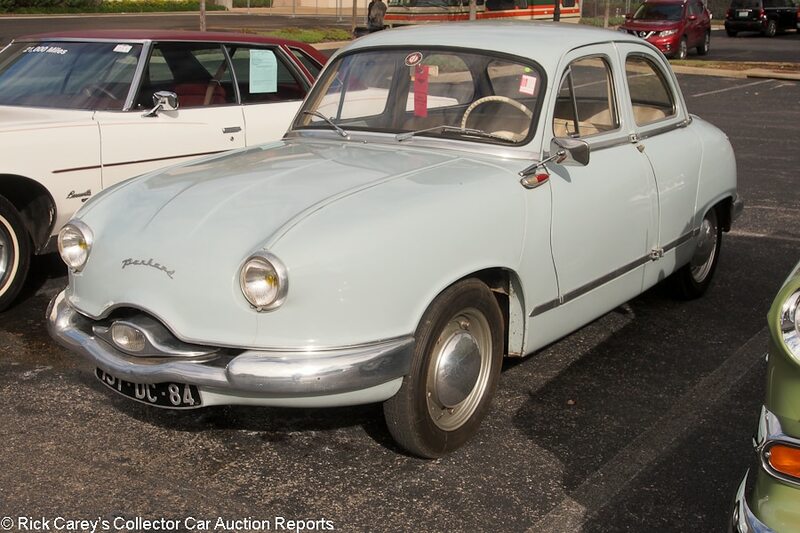 Still, finding a buyer willing to undertake the notable task of making this Panhard run and drive, let alone be presentable, is not going to be easy and giving it transporter rides and paying auction entry fees is only adding to the investment in a “death by a thousand cuts” torture. 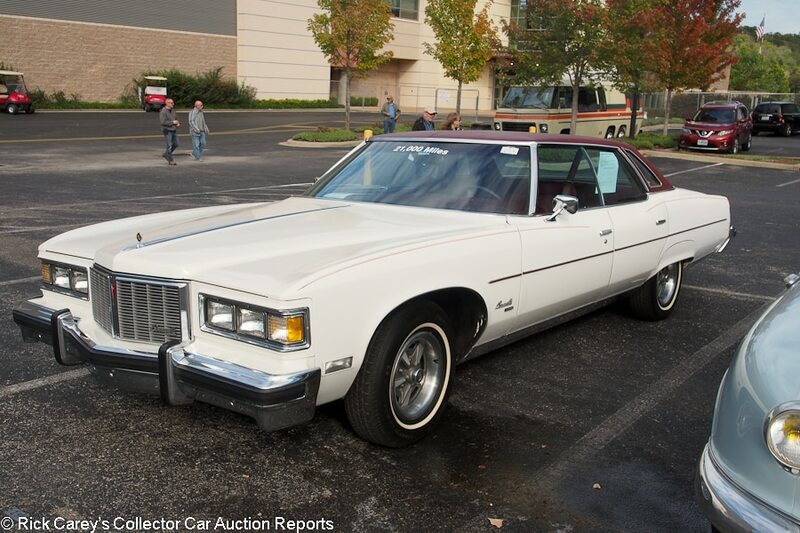 Lot # 251 1976 Pontiac Bonneville Brougham 4-Dr. Hardtop; S/N 2R49W6P307076; Engine # 0425852 Y3; White, Burgundy vinyl roof/Burgundy velour; Unrestored original, 3+ condition; No Reserve; Hammered Sold at $5,000 plus commission of 10.00%; Final Price $5,500 – 455/200hp, 4-barrel, automatic, power windows, steering and brakes, cassette stereo, tilt steering column, styled wheels with trim rings, narrow whitewalls. – Represented as 21,304 miles and looks like it. Sound original paint, chrome, interior and vinyl roof. The engine compartment and chassis are aged, original and as expected for the years and miles, i.e., grungy and road grimy. A surprisingly well-preserved and original ordinary Bonneville Brougham. – Reported sold at Mecum Kissimmee in 2017 for $11,550. That was a heavy premium for originality and it brought a much more reasonable result here in Branson. 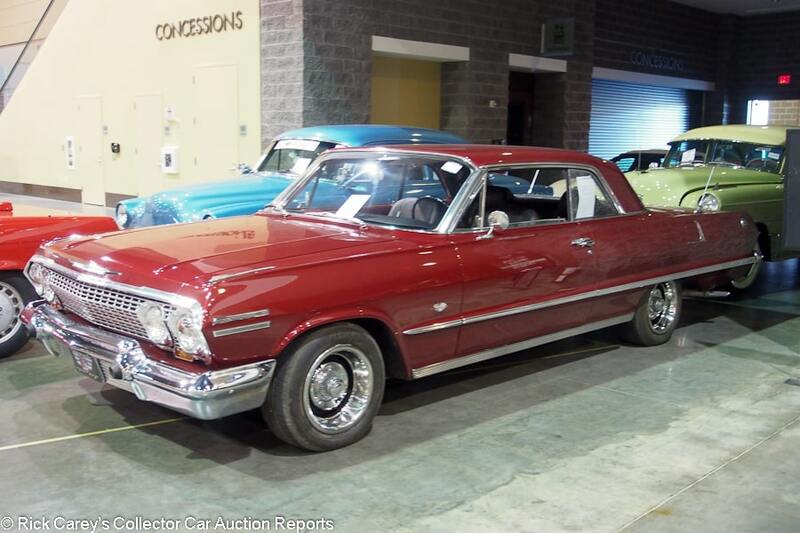 Lot # 258 1963 Chevrolet Impala 2-Dr. Hardtop; S/N 31847J193710; Engine # 2TXXG; Onyx Black/Black vinyl; Modified restoration, 3 condition; With Reserve; Hammered Sold at $27,500 plus commission of 10.00%; Final Price $30,250 – 409/340hp, 4-speed, Hurst shifter, buckets and console, Autogage steering column tach and underdash engine gauges, rear antenna, hubcaps, Michelin blackwalls, aftermarket AM-FM, power steering and brakes. – Microblistered repaint with a big blemish in the middle of the hood, erratic chrome, good newer upholstery. Old undercoat in the wheel wells. Orderly engine compartment. Represented as a period correct 409 engine. A usable weekend cruiser. – It may be a “period correct 409” but no one is calling it a 409 from new. Still, it is done fairly well, should be a blast to drive and this a reasonable price to pay for a weekend toy with exhilarating performance. 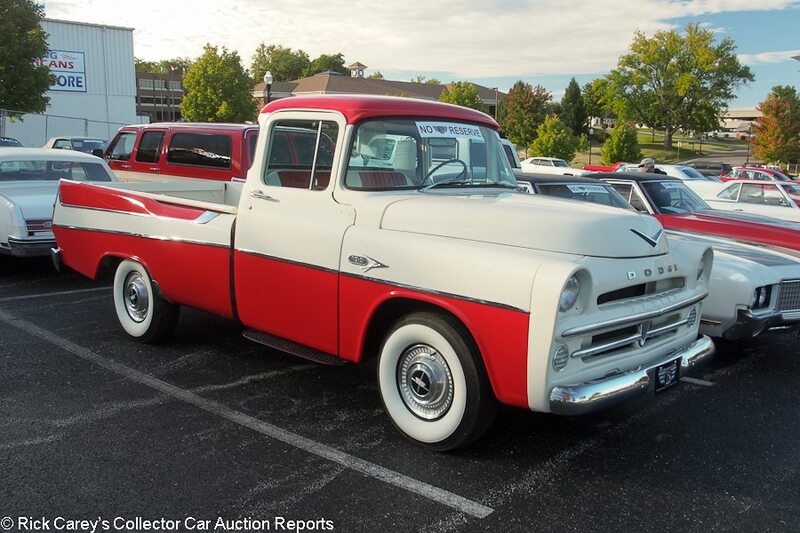 Lot # 279 1957 Dodge D100 Sweptside Pickup; S/N 84300529; White, Red/White, Red vinyl; Truck restoration, 3+ condition; No Reserve; Hammered Sold at $29,500 plus commission of 10.00%; Final Price $32,450 – 315/204hp, 2-barrel, pushbutton automatic, wood bed floor, stainless bed strips, turn signals added, wheel covers, wide whitewalls. – Sound but aged paint, chrome and interior. Bed wood cries out for varnish. Hood ornament missing and the hood has a sizable black blemish. Chips under the hood edges. Dull brightwork but good bumper chrome. The frame and underbody have been restored like new a while ago. Good glass. A sound and unusual truck that will benefit from attention. – This result is all about the Sweptside bed which had bidders oblivious to the many condition issues. It is too cool to keep around for dump runs (even if it is in dump run condition) so this is the start of a restoration project that will be fun but take a while and be expensive, especially if it’s done right. 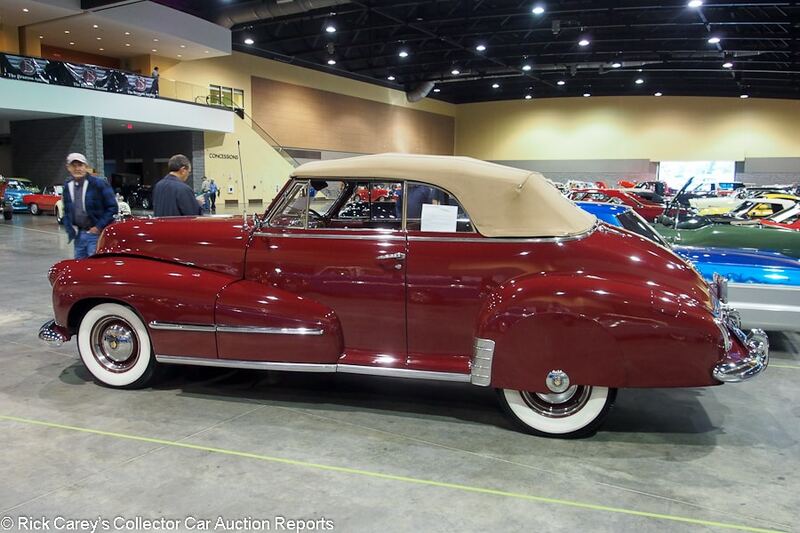 Lot # 574 1948 Oldsmobile Dynamic Convertible Coupe; S/N 927384H; Dark Red/Dark Red leather; Tan cloth top; Cosmetic restoration, 3- condition; With Reserve; Not sold at Hammer bid of $33,000 plus commission of; Final Price $33,000 – Hydramatic, pushbutton radio, power top, skirts, hubcaps and trim rings, wide whitewalls, bumper overriders. – Scuffed old paint with hood edge chips and a bad area on the rear body near the top. Peeling paint on the right window sills. Chips around the hood. Weak chrome. Sound upholstery and top. Crazed steering wheel center and gauge lens. Chassis and underbody painted over old undercoat and dirt. The engine compartment has been quickly repainted in place. The body appears to be sound, but that’s one of the best things about it. Superficially restored in the 80’s and thoroughly in need. – This is a sound and respectable bid for this Oldsmobile’s condition, a bit more respectable than the Oldsmobile. 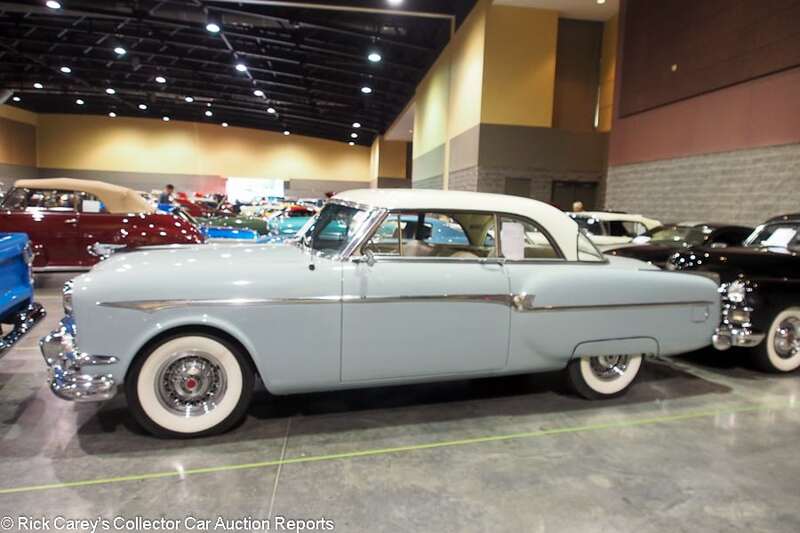 Lot # 583 1953 Packard Mayfair 2-Dr. Hardtop; S/N 26774615; Light Blue, Ivory roof/Ivory, Blue vinyl; Visually maintained, largely original, 3- condition; With Reserve; Hammered Sold at $19,000 plus commission of 10.00%; Final Price $20,900 – Thunderbolt Eight, 4-barrel, automatic, power steering, WonderBar radio, chrome wire wheels, wide whitewalls, skirts, heater. – Dull old repaint in the original light blue with masking misses. Dirty unrestored engine compartment and surface rusted original underbody. Stiff, dry original upholstery. Thin, pitted chrome worn through on the left parking light and rear bumper overrider. A sound restoration project. – Offered here this April where it was bid to $13,000. It brought a bit more today and the consignor prudently took the money. 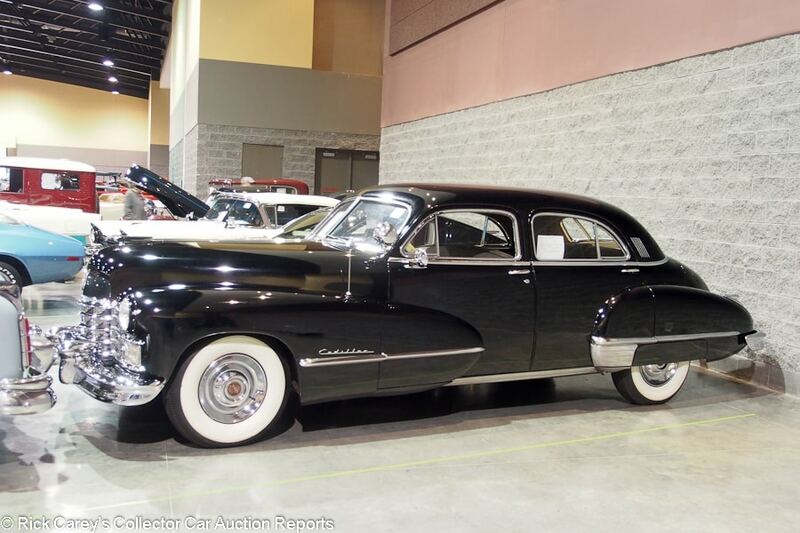 Lot # 584 1947 Cadillac Sixty Special 4-Dr. Sedan; S/N 6426364; Black/Grey broadcloth; Visually maintained, largely original, 4+ condition; With Reserve; Hammered Sold at $18,500 plus commission of 10.00%; Final Price $20,350 – Automatic, pushbutton radio, heater, clock, skirts, sombrero wheel covers, wide whitewalls, remote spotlight. – Thick older repaint over old paint, scuffed and scratched. Scuffed and scratched trim. Musty original interior. Dry old undercoat. A sound but tired old car. Originally owned by the Pabst brewing family. 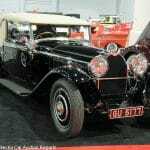 – There’s restoration in this Sixty Special’s future and when it’s done it could be worth $90,000 or more, but it is a long and winding road paved with many pictures of dead presidents to get there. It was bought appropriately for what it is and what it will cost to get it through the restoration shop. Lot # 592 1953 Ferguson T3 Tractor; S/N TO-110776; Silver, Red/Black vinyl; Customized restoration, 2+ condition; With Reserve; Not sold at Hammer bid of $16,000 plus commission of; Final Price $16,000 – 4.2 liter Jaguar six out of an ’85 XJ6 Vanden Plas, Rochester Quadrajet on the modified FI manifold, zoomy exhaust pipes on reversed XJ6 cast headers, overdrive 4-speed, GPS, two radiators to keep it cool (with dual coolant temperature gauges reading in and out of the cooling system), comprehensively instrumented, buddy seat over the diamond plate rear-mounted fuel tank. – Incredibly ingenious and neatly built to Pebble Beach standards. The owner said, “I wanted something unusual and thought about putting a V-8 in it. My neighbor said, ‘I have a better idea, a Jaguar six. '” The rest is in evidence here and no one at Branson who loves vehicles missed its appeal. It started in a heartbeat, idled like a baby, and sounded like a banshee. The owner said it would go 50 mph but was hard to ride at that speed (probably harmonics on the vee-treaded drive tires) and cruised comfortably at 40mph. An astoundingly original creation in impeccable condition. – This tractor showed up here six months ago and sold for $12,540 then was offered at Mecum’s Harrisburg auction in August of last year where it was reported bid to $15,000. It would be instructive to see what reception this would get at a Mecum Gone Farmin’ auction (probably not much, those Gone Farmin’ tractor collectors are purists) but as a parade vehicle pulling a wagon loaded with Little Leaguers or Girl Scouts it is in a league of its own. Is it worth more than $15-16,000? To the right collector with an individual sense of values it is, the challenge is finding two of them to bid it up. Great auction to attend – wonderful facility, right in the heart of Branson. 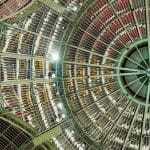 If you look for great places to go with an auction, this one is it.